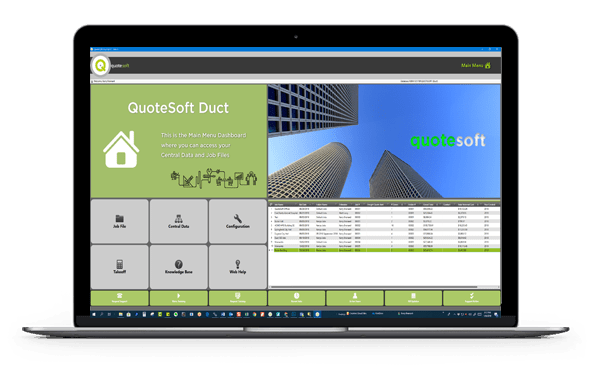 No two ductwork contractors are exactly alike – and QuoteSoft Duct is the only Cloud connected solution, customized to fit your every need. 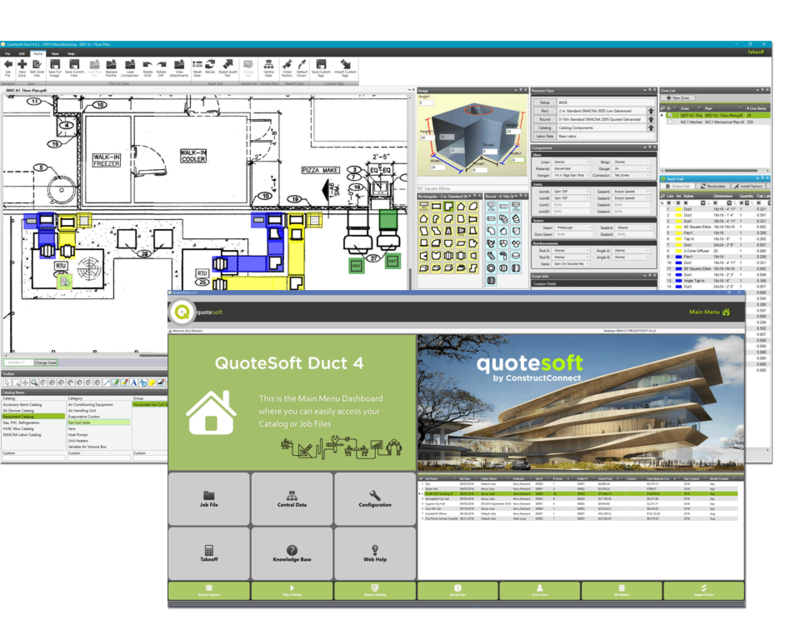 QuoteSoft estimating software is a powerful software solution for ductwork and HVAC contractors who need a simple to use tool to estimate labor hours and material costs for ductwork, pipe, and fittings. Preparing accurate takeoffs requires a tremendous amount of knowledge, formulas, materials, specifications, labor rates, and factors. Finding people with the right skills is not easy. QuoteSoft Duct offers an alternative. By customizing QuoteSoft with the knowledge of your senior estimators into company-standard data tables, takeoff can be done by part-time or entry-level estimators and or project managers and your senior staff can focus on working the crucial takeoffs that will ensure winning profitable jobs and improving the bottom line. QuoteSoft has available SMACNA specifications and standard labor times, which is modified for any type of duct system. Custom specifications are programmed to match your company’s standards for duct construction during your installation and training, and can be set up with allowances for purchased ductwork, spiral pipe, and fittings. 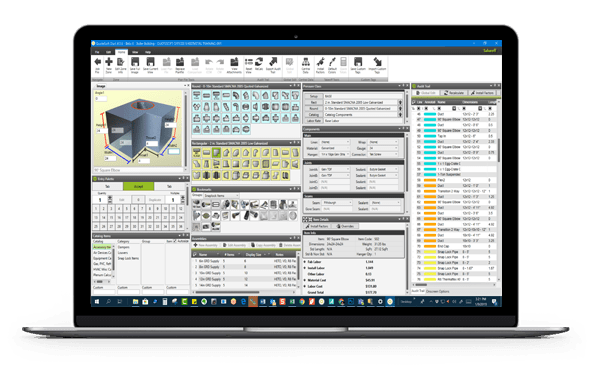 QuoteSoft takeoff automatically calculates all metal pounds, costs, square feet, liner, equipment costs, shop and field labor with a single click. With QuoteSoft duct estimating software all values are instantly available during takeoff, including the ability to override the standard hours and dollars and insert custom values. This means no more wondering what’s going into your bid. QuoteSoft is the ONLY PROGRAM that makes it easy to be comfortable with your numbers right away because you can see and override all data going into your bid during takeoff. Data Visibility – The right values every time. Only QuoteSoft Duct can do that. Unlimited Cloud QuoteSoft data storage. QuoteSoft Duct can be installed on as many computers as you need and automatically keep track of the number of users and jobs through the company network. 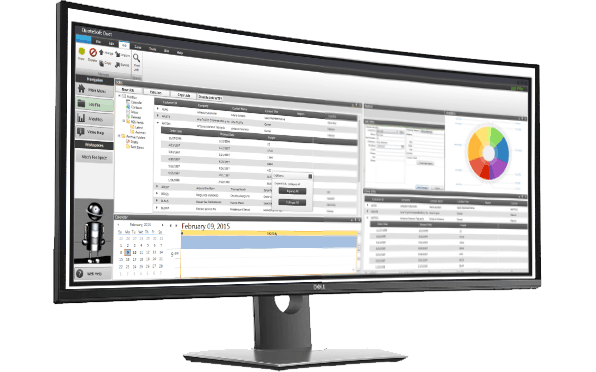 QuoteSoft software is scalable it can grow with your company. 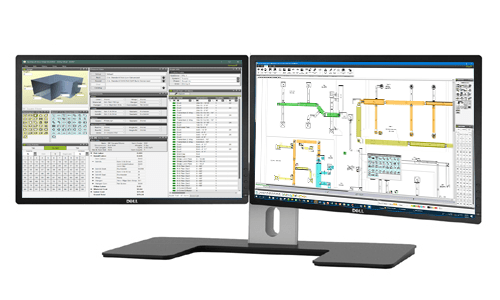 You can purchase multiple stations for additional estimators to use the software simultaneously. Our server-based design can scale from a single computer to dozens of computers in a network and still make it easy for you to bid your jobs, and share the job and bid information throughout the company. Rectangular File – Rectangular duct and fittings including elbows, tees, transitions, tap-ins, and laterals. Round / Spiral File – Spiral and long seam pipe and fittings including elbows, tees, reducers, tap-ins, and laterals. Oval File – Oval pipe and fittings including elbows, tees, reducers, offsets, tap-ins, and laterals. Accessory File – Snaplock pipe and fittings, grills, diffusers, volume dampers, fire dampers, louvers, etc. Equipment File – Roof top units, VAV boxes, terminal units, exhaust fans, furnaces, filters, etc. Assemblies – Unlimited assemblies files. Assemblies can contain any type of fitting, accessory equipment item. Excel generator with customizable bid summaries and reports. Standard labor and material figures pre-installed. Includes complete rectangular duct and fittings, round and spiral pipe. Full oval spiral and log seam pipe and fittings libraries. Includes rectangular files aspect ratio labor adjustments. Complete spiral pipe and fittings library. Sample files for most ductwork material types for galvanized, aluminum, stainless steel, duct-board, and cold roll. Accessory file includes snap lock pipe and fittings plus grills, diffusers, dampers, flex duct, access doors, etc. Unlimited equipment /catalog items with multiple accessory files available. 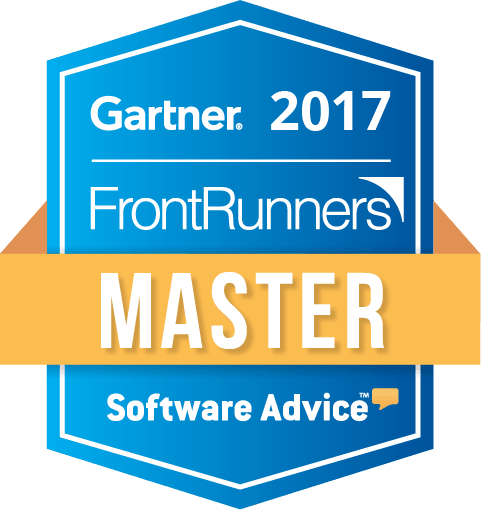 Includes one year of implementation customizations and programming, technical support, training, and basic software maintenance. Many of our customers have switched from competing software systems. Why would they switch to QuoteSoft after purchasing another system? Commonly, business owners tell us that off the shelf systems turned out to be not a good fit or to generic for the estimators to use for the way they bid jobs. QuoteSoft offers LIVE support and training 10 hours a day, Monday thru Friday. Over half of our supports call are handled instantly – when you need it. During peak hours, our call queue is short – usually just minutes to have your questions answered. Our support and training personnel come for the industry. Former pipe fitters, sheet metal men and plumbers, as well as computer techs are on-call to answer you estimating questions. Learn more about or support services including BIM data migration, file type conversion, job data storage, average hour cost consulting, labor analysis and normalization using QquoteSoft server cloud drives. All QuoteSoft programs include one year of implementation customization, unlimited phone training and software setup plus one year of technical support and basic program maintenance updates.